Reopening a disused rail line can transform an area, boosting the local economy, creating better places to live and reducing carbon emissions. But despite hundreds of reopenings being proposed, few reach construction. 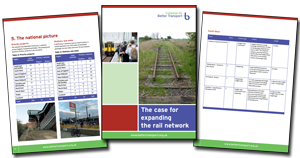 Our new report, The case for expanding the rail network, calls for a national programme of rail reopenings and identifies 33 disused lines that should be given first priority. Using a new methodology we rated lines both for their viability and for the social, economic and environmental benefits they would bring if reopened. To read The case for expanding the rail network, please fill in your details below. The report is free and we won't sign you up to our e-newsletter unless you tick the box to say we can.